Losing a loved one is a gut-wrenching, traumatic event. Losing a teenage child makes the pain and emotional agony that much worse. Two families in Miami-Dade are grappling with this trauma after two teenage passengers were killed in an automobile accident. The victims were only 17 and 18 years of age. The two victims were passengers in a Toyota Corolla that was traveling west on Northwest 173rd Drive when a Toyota Tacoma slammed into the Corolla at an intersection. The collision caused the Corolla to them strike a fire hydrant and a tree. One of the teenage passengers died at the scene of the crash while the other was transported to Jackson Memorial Hospital with catastrophic injuries that ultimately led to his passing. The driver of the Tacoma did not suffer any injuries in the collision, according to the Miami Herald.com. Florida allows the beneficiaries of a decedent’s estate to file a lawsuit in a Florida civil court to recover financial restitution for the untimely and preventable death of their loved one. Specifically, Florida Statute § 768.19 states that when someone’s death is proximately caused by the wrongful act of another, the estate of the decedent is able to file a wrongful death lawsuit. When someone loses their life in an automobile accident, the source of financial recovery is typically the automobile insurance policy of the negligent driver. A claim will need to be filed with the insurance company stating the amount of damages. If the insurance company refuses to offer a fair and reasonable settlement, a lawsuit should be commenced by your Miami wrongful death attorney. 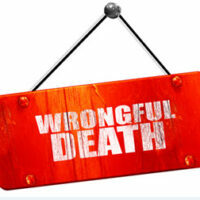 The Florida Wrongful Death Act requires a wrongful death lawsuit be filed by a personal representative of the decedent’s estate. An individual may bring a wrongful death claim if they are related to the decedent including (i) the decedent’s spouse, (ii) the decedent’s child, (iii) parents of the decedent, or (iv) blood relatives who were dependents of the decedent. Florida law requires that a wrongful death lawsuit be filed within a specified period of time known as the statute of limitations. In Florida, you have four years from the date of your loved one’s death to file this claim in a Florida court. If you wait to file after four years have passed, there is a very good chance that a judge will simply dismiss your case. The wrongful death claims process can get complicated very quickly. There are important legal deadlines and filing requirements you must meet in order to have a viable claim. That is why you should hire the wrongful death attorneys of Alan Goldfarb, P.A. We possess decades of experience handling wrongful death claims.